The National Hurricane Center issued a hurricane warning and a storm surge warning late Thursday for south Florida and the Florida Keys as the storm headed toward the state. Irma was located 585 miles east-southeast of Miami as of late Thursday, the National Hurricane Center said. The storm's fercious winds had slowed a bit to a still-powerful 165 miles per hour. The eye of Irma is expected to move westward from the Turks and Caicos Islands and toward the southeastern Bahamas overnight Thursday. A hurricane warning is in effect for Jupiter Inlet southward around the Florida peninsula to Bonita Beach; Florida Keys; Lake Okeechobee; Florida Bay; Haiti from the northern border with the Dominican Republic to Le Mole St. Nicholas; southeastern Bahamas; the Turks and Caicos Islands; Cuban provinces of Camaguey, Ciego de Avila, Sancti Spiritus, and Villa Clara; Central Bahamas and Northwestern Bahamas. A storm surge warning is in effect for Jupiter Inlet southward around the Florida peninsula to Bonita Beach and the Florida Keys. Miami-Dade County tweeted Thursday night that they will be announcing on Friday the opening of 13 additional shelters. 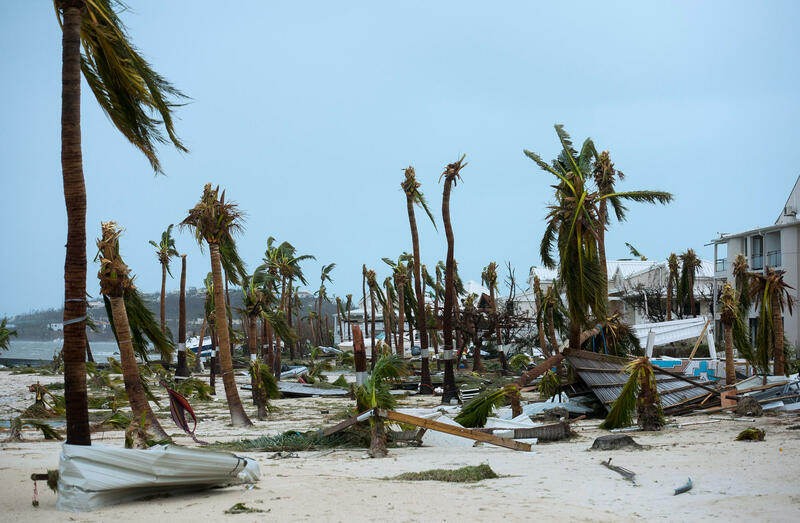 French, British and Dutch rescuers rushed aid to a heavily damaged string of Caribbean islands Thursday after Hurricane Irma, a powerful Category 5 storm, left a path of destruction. Irma left at least 10 people dead, scores injured and thousands homeless as it spun toward Florida for what could be a catastrophic blow this weekend. Warships and military planes were dispatched with food, water and troops after the fearsome Category 5 storm smashed homes, schools and roads, laying waste to some of the world's most beautiful and exclusive tourist destinations. Meanwhile, Florida braced for the onslaught, with forecasters warning Irma could slam headlong into the Miami metropolitan area of 6 million people, punish the entire length of the state's Atlantic coast and move into Georgia and South Carolina. More than a half-million people in Miami-Dade County were ordered to leave. "Take it seriously," said Maj. Jeremy DeHart, a U.S. Air Force Reserve weather officer who flew through the eye of Irma at 10,000 feet. "Because this is the real deal." The U.S. National Hurricane Center's (NHC) 8 p.m. advisory said Irma is pummeling the Turks and Caicos island, has sustained winds of 175 mph and the storm is moving west-northwest at 16 mph. NHC says in the latest advisory that the government of the Dominican Republic has discontinued the hurricane warning east of Cabo Frances Viejo and the tropical storm warning for the southern coast of the Dominican Republic. French Prime Minister Edouard Philippe said four people were confirmed dead and about 50 injured on the French side of St. Martin, an island split between Dutch and French control. The toll could rise because rescue teams had yet to get a complete look at the damage. Three more deaths were reported on the British island of Anguilla, independent Barbuda and the Dutch side of St. Martin. The death toll on St. Martin was lower than one given earlier Thursday by France's interior minister, who said eight people were killed on French Caribbean territories. An official in Philippe's office told The Associated Press only four people were confirmed dead after a re-evaluation of the damage. The official said the toll could rise as rescuers reach the scene. Late Thursday, officials announced that four people died on the U.S. Virgin Islands. The information was confirmed by an emergency official and an official in the office of Governor Kenneth Mapp, according to the AFP news agency. "We are not sanguine that there aren't more (dead)," spokesman Lonnie Soury said by telephone from New York, according to the Reuters news agency. A government spokesperson told Reuters that widespread damage in the U.S. Virgin Islands included infrastructure and a major hospital. In St. Maarten, Dutch Interior Minister Ronald Plasterk said one person was confirmed dead in the former colony. He also said there are a number of injuries and that the authorities still only have an "incomplete picture" of the damage. Irma also slammed the French island of St. Barts, tearing off roofs and knocking out electricity. "It's a tragedy. We'll need to rebuild both islands," he said. "Most of the schools have been destroyed." Photos and video of St. Martin circulating on social media showed major damage to the Philipsburg airport and heavy flooding in the coastal village of Marigot. "There is no power, no gasoline, no running water. Houses are under water, cars are floating through the streets, inhabitants are sitting in the dark in ruined houses and are cut off from the outside world," he said. Far out in the Atlantic, Jose grew into a major hurricane Thursday, threatening some of the same islands ravaged by Irma. Meanwhile, Irma, the most potent Atlantic Ocean hurricane ever recorded, appeared increasingly likely to rip into heavily populated South Florida early Sunday. Florida Gov. Rick Scott warns Hurricane Irma "storm surge can kill you"
People rushed to board up their homes, take their boats out of the water and gas up their cars. With gasoline running out and tensions rising, the Florida Highway Patrol escorted tanker trucks sent to replenish gas stations. "It is wider than our entire state and could cause major and life-threatening impacts from coast to coast. Regardless of which coast you live on, be prepared to evacuate," Gov. Rick Scott said. Brian McNoldy, a hurricane researcher at the University of Miami, said Irma could easily prove to be the costliest storm in U.S. history. Ahead of Irma arriving in Florida, Gov. Scott announced Thursday that he's directing all K-12 public schools, state colleges and universities and state offices to close beginning Friday until Monday. "Floridians are facing a life-threatening storm in Hurricane Irma, and every family must prepare to evacuate," Gov. Scott's statement read. "Our state's public schools serve a vital role in our communities as shelters for displaced residents and staging areas for hurricane recovery efforts. Closing public schools, state colleges, state universities and state offices will provide local and state emergency officials the flexibility necessary to support shelter and emergency response efforts." French President Emmanuel Macron's office said he would go to the Caribbean islands as soon as the weather permits it. Saying he was "grief-stricken," Macron called for concerted efforts to tackle global warming to prevent similar natural disasters. Two Dutch navy ships were in St. Martin with vital supplies. And two Dutch military aircraft were being sent the island of Curacao and on to St. Martin to deliver food and water intended to last the population of 40,000 five days. The aircraft were carrying 100 extra troops to deliver aid, repair infrastructure and restore order. On Barbuda, nearly every building was damaged when the hurricane's core crossed almost directly over the island early Wednesday. About 60 percent of its roughly 1,400 residents were left homeless, Antigua and Barbuda Prime Minister Gaston Browne said. He said roads and telecommunications systems were wrecked and recovery will take months, if not years. A 2-year-old child was killed as a family tried to escape a damaged home during the storm, Browne said. CBS News' Tony Dokoupil reported from Fajardo, Puerto Rico, Thursday night and met survivor Ron Robles who said Hurricane Irma was loud. Robles spent a sleepless night when his roof blew off from Irma. "That's the roof," he showed CBS News pointing to it scattered among a field. "That thing blew up." He said it only took a mere three seconds for Irma to destroy his home. President Trump approved an emergency declaration for the U.S. Virgin Islands and Puerto Rico, allowing federal agencies to step in and provide aid. The NHC predicted Irma would remain at Category 4 or 5 as it passed just to the north of the Dominican Republic and Haiti, neared the Turks & Caicos and parts of the Bahamas by Thursday night and skirted Cuba on Friday night into Saturday. Haiti ordered the evacuation of coastal areas in the north of the country, while Cuba's eastern Santiago province opened 125 evacuation centers that can hold 38,000 people.